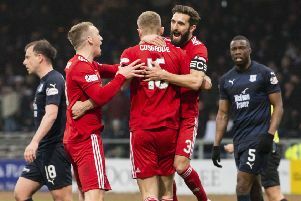 Cosgrove celebrated reaching the 20-goal mark at the weekend when he struck a timely second-half double to help Derek McInnes’ visitors overcome bottom-club Dundee, providing the perfect platform going into Sunday’s Scottish Cup semi-final encounter with Neil Lennon’s treble chasers at Hampden. Despite a stuttering start, the 22-year-old has proceeded to claim an impressive haul in front of goal and, in so doing, silence his critics who claimed the former Wigan man would never prosper in the Scottish top-flight following his move north of the border in January 2018. It’s a quite remarkable tally to have claimed in his first full season in Scotland but the Englishman has unfinished business and believes saving his best for Celtic in their last-four tie would eclipse anything up until now. “I think scoring at Hampden would top the lot,” smiled Cosgrove. “It’s well noted that this is probably the biggest game of the season and we’re all relishing the chance to play there and get through with a win and get through to another final. “I think it’s been typical of us this season: we’ve put in our best performances against the stronger sides. “You can include the Old Firm in that. You look at the 0-0 at their place [Celtic] a couple of weeks ago, you could argue that as much control as they had, we were perhaps unlucky to come away without a win. taken spot-kick to put the Dons on the road to victory on Tayside, before his 77th minute clincher from Connor McLennan’s assist ensured a happy journey home to the Granite City for their jubilant travelling support. The 6ft 2in forward is bursting with pride courtesy of his exploits and even revealed his pre-season target was simply to nail down a regular first-team starting slot following his switch from Carlisle. “Ever since I got on to my goal trail, I was made well aware of the prestige that comes with getting 20 goals at this club,” said Cosgrove. “You just look at Adam Rooney, who did it for numerous years, and the plaudits that he’s got for it. Cosgrove couldn’t stop Celtic sweeping to another trophy under former manager Brendan Rodgers thanks to Ryan Christie’s winner in the League Cup final at Hampden in December, although he was an integral part of the visiting side which held the champions to a recent 0-0 draw at Parkhead. Now, though, the ex-Carlisle forward is relishing his return to Glasgow and believes he’s a different proposition altogether from the one which faced the holders at the National Stadium four months ago. “The League Cup was a tough one to take,” he reflected. “It’s well known that Celtic have that quality and they need that one chance and they’ve put it away. Meanwhile, Craig Curran, pictured below, insists Dundee haven’t thrown in the towel in their faltering bid for Premiership survival. 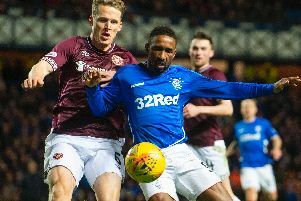 Their latest set-back leaves the Tayside club three points adrift at the foot of the table and with a mountain to climb, but striker Curran is adamant they haven’t lost hope of staying up with just five post-split fixtures remaining. “This isn’t where we expected to be,” conceded Curran, left.